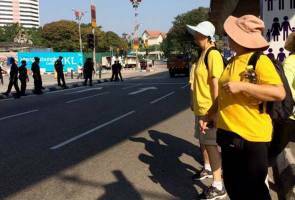 KUALA LUMPUR: The Bersih 4 rally has grown larger, with many returning from a break and others joining the crowd for the first time at Dataran Merdeka and the Song Kheng Hai field in Kuching. In Sabah, the gathering held at the Taman Awam Likas in Kota Kinabalu dispersed at 9pm Saturday, but the rally will start again at 8am today. At Dataran Merdeka, participants listened to speeches of opposition and NGO leaders. In between the speeches, the crowd was treated to poetry reading and standup comedy. The audience also heard songs with political messages. The backs of lorries were converted into stages complete with sound systems. Some of the participants took time off for dinner at nearby restaurants while others shopped at the Central Market, Petaling Street and other places in the vicinity. In Kuching, participants returned to the Song Kheng Hai field at 9pm where they too listened to speeches and heard poetry recitals. They also lighted candles. Reporters on the ground found the situation at both venues to be under control although thousands filled the area around Dataran Merdeka. The Bersih 4 two-day rally that the police have declared as illegal is organised by the electoral reform group Bersih 2.0 which says it is fighting for clean and fair elections, and a clean government, among other things.